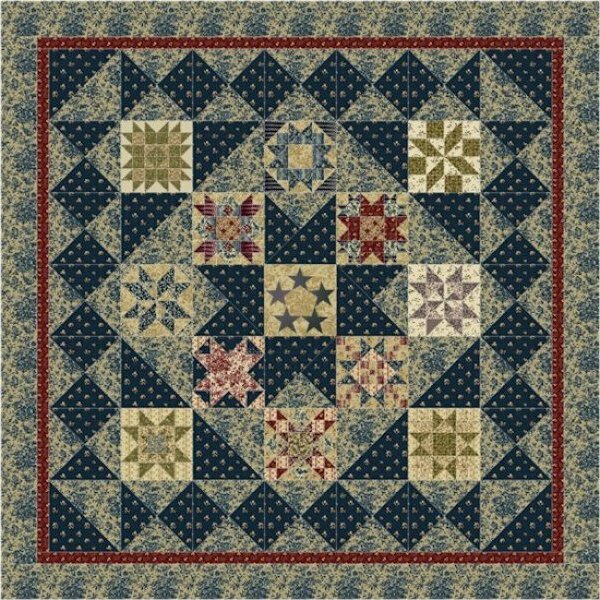 A lovely new fabric collection has been designed by Nancy Gere for Windham Fabrics intended for this new BOTM designed by Jerry Stube honoring the Generals Wives of the Civil War. April 12, 2011 marked the 150 anniversary of the firing of cannons on Fort Sumter, South Carolina marking the opening day of the Civil War; a war that would divide families, friends, and a country and ultimately take the lives of over 618, 000 soldiers, about 2% of the population of our country at that time. The generals who served during this time had been friends, classmates and sometimes, even roommates at West Point prior to the war. Theirs was now the task to destroy that friend to support the cause in which they believed. This was not an easy decision. The wives of these generals had to support her husband as he wrestled with those decisions. She had to keep the home fires burning and keep the children and families together at a time that was extremely dangerous for her. The wives of Confederate generals also had the concern that the actual battlefield could be in hertown or on her property. Most of the women on the Southern side lost all their possessions and homes. These were extremely brave and strong women who deserve all the recognition that can be afforded them. Nancy Gere has designed General's Wives, her proudest civil war fabric collection, and Jerry Stube's quilt design by the same name is created to honor these brave women, and truly, the wives of all soldiers who fight to preserve our cause, our country. In this Block of the Month program, the histories of these women will be offered along with the pattern each month in hope that the quilter will enjoy learning a bit more about these brave women. The center block is a representation of the rank insignia of General of the Army, a five star general. A few of the generals who served during the Civil War were recognized as General of the Army however, there was not a five star rank at that time. The rank itself did not appear until much later. Make eight of these for the first quarter. Save all scraps. Measure twice, cut once. Block Two. Watch, that red stripe is directional. Block Three. Now take a break. Good job.